How is Taekwondo different from other martial arts? Taekwondo is a Korean martial art that utilizes the hands and feet for blocking and striking. Unlike grappling or wrestling styles like Judo or Jujitsu, the methods for offensive and defensive techniques are strikes and blocks. Geographically, Korea is between China and Japan. China is known for “soft style” martial arts like Kung-Fu and Tai Chi which utilizes flowing, circular techniques. Japan is known for “hard style” martial arts like Karate which utilizes direct strikes with the hands and feet. Taekwondo was influenced by both countries and is thus a combination of the soft and hard style. Taekwondo is known for a wide array of kicks including spinning kicks and jump kicks. Taekwondo students also practice forms/hyungs/poomse/katas which are choreographed patterns of movement which utilizes stances, blocks, hand strikes and kicks and requires focus, memorization and proper breathing, technique and balance. 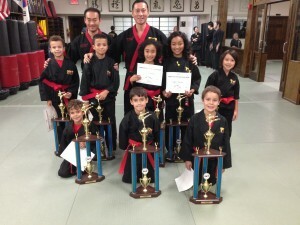 Students from ages 3 – 50+ tested from white belt to high red. We had over 100 students testing for their color belts! You all did a great job! Keep it up! Our next color belt test will be December 10th. 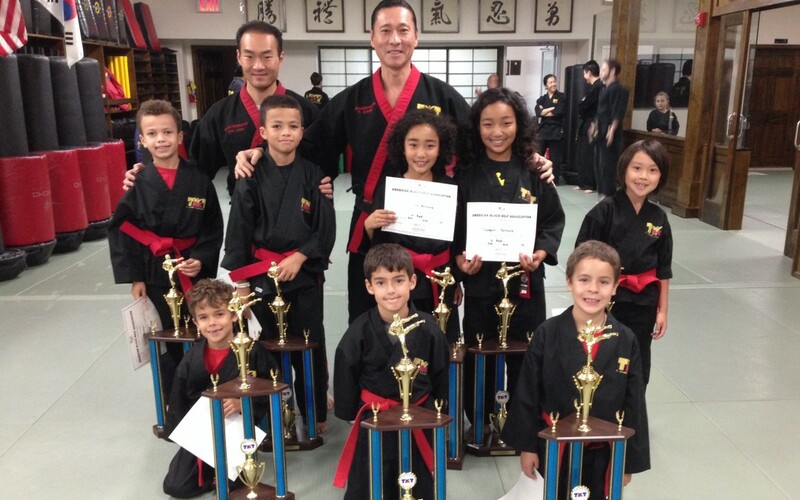 If you would like us to add your pictures to the gallery, please email them to tkangtkd@gmail.com. What are the benefits of Taekwondo? Practical and effective self-defense: All martial art styles can be effective but against an attacker who is much bigger than you, no matter how skilled you are at grappling or wrestling, you will still be at a disadvantage. By utilizing precise striking techniques, you can defend yourself with a hand strike or kick to a vital area. Improved body flexibility and posture: Taekwondo utilizes high kicks which require stretching. Stretching helps prevent injuries and keeps your joints from tightening as you age. Improved muscle coordination and balance: Kicking requires students to balance on one leg, which not only strengthens the legs but your core as well. Improved mental and physical stamina: Sparring is one of the best cardiovascular workouts you can experience. Our students easily burn up to 1000 calories per hour in a sparring class. Not only does it require physical stamina but also requires you to be mentally alert. Figure and weight control: Taekwondo is a great workout! Many of our students have lost weight just from training a couple of days a week, without having to drastically change their diet. Improved self-confidence: As you learn more skills and techniques in Taekwondo, your confidence goes up not only during training, but outside of training as well. Improved concentration: Forms – one of the aspects of Taekwondo – require not only memorization but also deep focus and concentration. Reduced stress, anxiety and tension: Training in Taekwondo feels good! Punching and kicking and yelling helps your body get rid of stress. Students come in to class stressed and tense. They leave relaxed. Elevated consciousness toward a self-will to reduce bad habits: As students get more and more involved in Taekwondo, their desire to improve increases. They realize that bad habits like smoking or drinking or eating too much junk food hold them back from improving. Many of our students have gone from smoking multiple packs of cigarettes a day to quitting altogether! A sense of personal accomplishment: As students advance in belt rank and see the improvement they have made since being white belts, they realize how much work and effort they put into that transformation. T. Kang Taekwondo has a new website! We are very excited to introduce our new website! Please take a look around; we hope you enjoy the website as much as we do! Special thanks to Jeff, Nancy and Astrid Mignon at RevSquare for designing the website and producing the beautiful video on the main page! Stay tuned to this page for blog updates.